The good folks at the Mennonite Disaster Service are committed to the long haul to help disaster victims in Winston County. Volunteers from all over the country, particularly Pennsylvania, Indiana and Ohio have already been in the area and completed thousands of hours of cleanup around Winston County. M D S is currently constructing a camp/worksite for volunteer workers who will help with construction and repair for as long as two years. Working with Winston Strong's Community Based Recovery Committee, MDS has already begun repair work on some homes and will be involved in the construction of homes for those who had insufficient insurance and/or FEMA compensation to rebuild. children about our veterans and the freedoms we enjoy because of the sacrifices that has been made by these brave men and women. Bring a Veteran to be in the parade with you!! The Annual Fireworks Display will also be held on July 3, 2014 after the Red White and Blue Parade at 9:00 pm at Lake Tiak-O’Khata. They will have a hamburger, hot dog and chicken strip buffet.Live entertainment will be provided at the pavilion on the water beside the restaurant by Mark Goldbeck. The agenda for the July 1, 2014 Louisville Board of Aldermen is now posted on the City's website. To view the agenda, click here. City officials meet at 5:30 pm on the first and third Tuesday of each month. The Winston County Chancery Clerk has provided a public notice of land sold for taxes in 2011 that will mature to the purchaser on August 27, 2014. This list is available on the County's website and can be viewed by clicking here. An updated list will be provided at a later date. Redemption of the properties listed may be made by paying all taxes, fees,. etc on or prior to August 27th, otherwise a tax deed will be provided to the purchaser. CORRECTION & UPDATE: Property owners who wish to burn (Building debris cannot be burned in the city limits, only vegetative material) within the city limits of Louisville are required to have a permit issued by the Louisville Fire Department. LFD must review the site and approve the burn before a permit will be issued. You may come by the Louisville Fire Department on Spring Street, Monday through Friday during normal business to apply for a permit or you may call 662-773-9402. Permits cannot be applied for over weekends. If you wish to burn on the weekend, you will need to get an approved permit prior to that time. This is a clarification of a previous post on WWN. It is not legal to burn building debris within the city limits of Louisville. As I shared with you in last week's Employee Update, Anne Clouse (NRHS Foundation), Jim Wade (NRHS Foundation Board Member) and I experienced the joy and emotion of delivering your financial gift to the employees of Winston Medical Center in Louisville, Miss. I had no idea of what to expect but I can assure that the experience was incredible. I have never received a grander welcome from total strangers than what we received from the good folks of Louisville. At the same time so many of the emotions that I felt during the loss of our Moore Medical Center came rushing back. I saw the same heart and courage in their staff that you showed during our loss. I have asked Anne and Jim to share their personal thoughts on the significance of our trip. 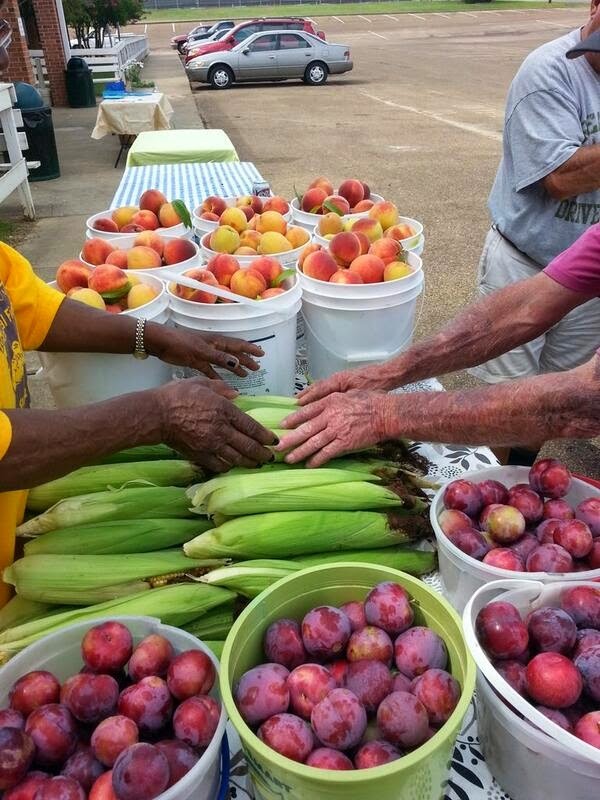 Don't forget Winston County Farmers Market every Thursday - 4 until.... Check out this fresh produce today!! This sweet cat is about 2 or 3 years old and has been neutered. He is very laid back and friendly and is looking for a good home. Come by the Louisville Animal Shelter located on 110 Thompson St. or call them at 662-773-4320. Thank you. Louisville. Winston Countians that may have suffered losses in the April 28 storm were given the opportunity to visit with FEMA, MEMA, SBA, Mississippi Department of Human Services, representatives of the Mississippi Department of Insurance and a multitude of businesses that provided services such as storm shelters and insurance claims assistance. Citizens were also able to discuss their status with case managers of Winston Strong to apply for and to learn what assistance may be available for long-term relief. 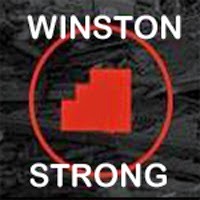 You can find out more about Winston Strong at their website at http://www.winstonstrong.org/or visit their Facebook page at Winston Strong. Public Service Commissioner Brandon Presley was in Louisville today (Wednesday, June 25) to recognize area East Mississippi Electrical Power Association employees for their efforts after the April 28 tornado. Presley presented a resolution from the Public Service Commission to a crowded room full of EMEPA employees commending the restoration efforts in the wake of April’s storm. Tuesday’s primary runoff election between incumbent Thad Cochran and Tea Party challenger Chris McDaniel put an end to a long and sometimes nasty campaign for the Republican party candidate for United States Senate. While McDaniel led the race in the June 3 primary, he was unable to capture a 50% majority, forcing the June 24 runoff. 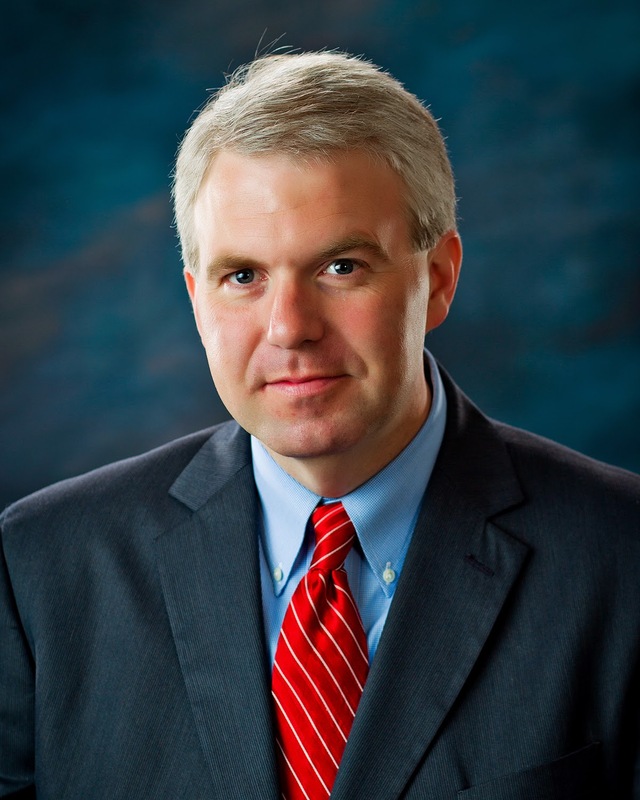 The incumbent Cochran was able to rally some additional support and in a very tight runoff, he was able to capture roughly 51% of the vote statewide and is expected to face Democrat Travis Childers in November for the Senate seat. Property owners who wish to burn debris,(UPDATE - Building debris cannot be burned in the city limits, only vegetative material) etc. within the city limits of Louisville are required to have a permit issued by the Louisville Fire Department. LFD must review the site and approve the burn before a permit will be issued. East Mississippi Electric Power Association reminds members to be cautious of potential scam artists posing as EMEPA employees. Members throughout EMEPA’s service area have reported calls from someone with a foreign accent claiming to work for EMEPA instructing them to call 800-598-1128 to make a payment immediately. The scammer claims a technician is on his way to cut out the member’s power if they do not immediately make a payment.EMEPA urges members to be cautious with personal and financial information. Never provide your Social Security number, credit card number or banking information to anyone requesting it over the phone or at your home unless you initiated the contact.EMEPA will not call requesting your personal or financial information and all EMEPA employees will have proper identification.If you do receive a call from someone claiming to be from EMEPA requesting such information, hang up and immediately report the call to local authorities. 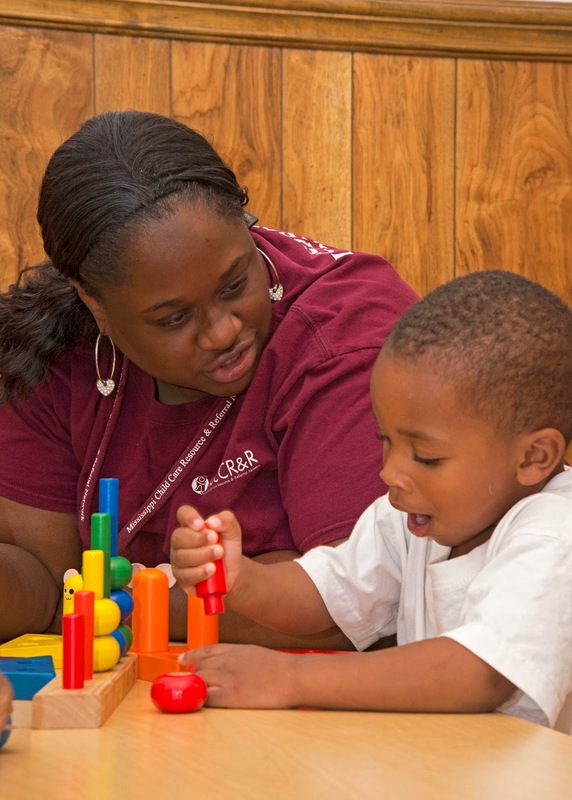 LOUISVILLE -- When the April 28 EF4 tornado leveled Destiny’s Day Care in Louisville, center owner Deborah Holmes was relieved by the quick response from two Mississippi State University programs. The first call Holmes received came from the Early Childhood Institute, a program of the MSU College of Education, which had previously provided technical assistance to her staff. “We contacted Mrs. Holmes to check on her, her staff and the children and found they needed help to reopen quickly,” JoAnn Thomas, project director at the Early Childhood Institute said. Registration is under way for the July session of summer classes offered at East Central Community College in Decatur. Classes, which get under way Monday, July 1, are held Monday through Thursday at various locations in the five-county district. before the tornado hit Louisville. Monday, June 30 at the close of business. The deadline to file an SBA Disaster loan application, including homeowners, renters and businesses of all sizes for physical damage is also June 30, 2014. See You Later - Alligator!! Winston County Sheriff's deputies captured this 3 foot alligator just south of Louisville near Hwy 15S on Monday. The critter was spotted by an employee of EMEPA who contacted the department. 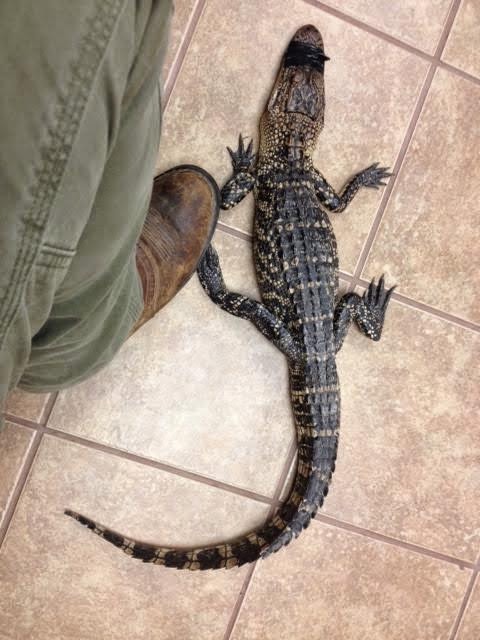 Staff in the Winston County Courthouse kept a wary eye on the gator until it was turned over to a local game warden. JACKSON, Miss. – Disaster survivors whose additional living expenses (sometimes termed “loss of use”) from their insurance company are running out and who still have a temporary housing need should contact the Federal Emergency Management Agency helpline (800-621-3362) immediately if they have not registered for disaster assistance.Those who have registered should fax or mail a letter to the address below, explain the situation, document the use and expiration of living expenses from insurance and update their permanent housing plan. Commissioner Presley will present a resolution on behalf of the Public Service Commission commending the restoration efforts of EMEPA in the wake of last April’s storm. The event will be held on Wednesday, June 25 at 1:30at EMEPA offices at 86 EMEPA Road in Louisville. For more information contact Commissioner Presley at 662-963-1471. Couple of Things to Know for the Weekend!! Summer officially gets here this weekend as we can all see by the weather. Here's few things you need to know about this weekend. Add your own by commenting on our Facebook post. Absentee voting ends at noon today. The Winston County Circuit Clerk's office will be open til noon on Saturday........Tonight is the last night of the Fair at the Louisville Coliseum. If you haven't made it over there yet, it's not too late. Rides are by Ms. Delta Shows...... There will be a sketching workshop at the refuge at 2 pm today. A New Orleans artist will conduct a sketching workshop of Noxubee’s native flora and fauna. See our events page for more details........Farmers Market in Noxapater starting at 7 am this morning- better hurry and ....... how does a nice cold watermelon and "mater" sandwich sound? Drop by Barbara's Place on N. Columbus today. Melons and tomatoes just in last night and they might have a few more fresh items. Have a great weekend and be careful not to get too hot today!!! ATLANTA – The U.S. Small Business Administration reminds homeowners, renters, businesses and non-profit organizations in Mississippi of the deadline to submit disaster loan applications for damages caused by the severe storms, tornadoes, and flooding between April 28 and May 3. The deadline to apply for a physical damage disaster loan is June 30, 2014. The SBA encourages residents and business owners to go ahead and apply for an SBA disaster loan even if they have not settled with their insurance company. “Waiting to file an SBA application could cause unnecessary delays in receiving disaster assistance, and survivors may miss the application deadline. Submitting the loan application is an essential part of the disaster recovery process.” said Frank Skaggs, director of SBA Field Operations Center East. MISSISSIPPI STATE -- A camera that began as a cool gadget for photographing bucks and monitoring food plots or game trails has become an important survey instrument for managing deer populations. White-tailed deer management involves more than managing habitats and planting supplemental food plots. Proper deer management requires managing populations as well. 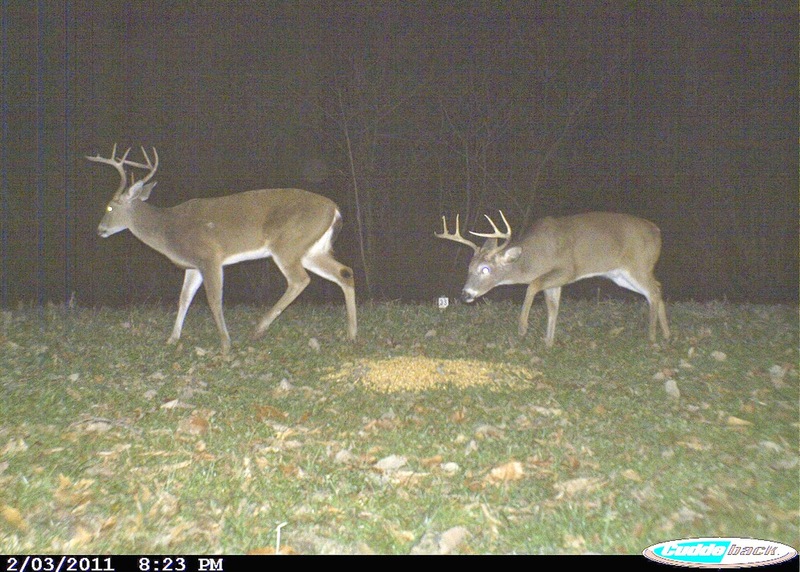 Deer managers can use game cameras to estimate deer population characteristics and develop good harvest management strategies. This will help maintain a healthy and productive deer herd. Winston Plywood and Veneer (WPV) is at home in Louisville. After a quiet merger with Natron Wood Products in March of this year, WPV was almost set to begin hiring for plywood production when the April 28th tornado destroyed the facility on South Church Avenue. Without hesitation, WPV and its parent companies, - New Wood Resources and Atlas Holdings, LLC made a commitment to rebuild and become a part of the Winston County community. Winston County EMA Director Buddy King says he has received numerous requests concerning possible storm shelter programs sponsored by FEMA. 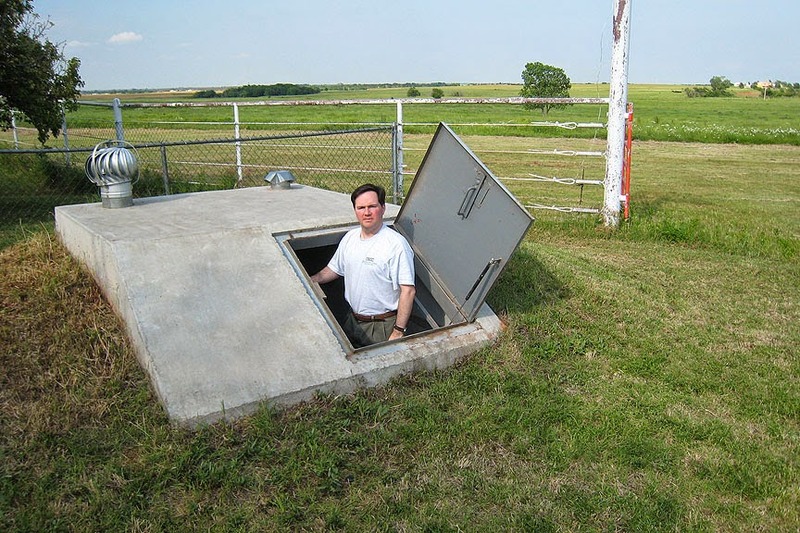 King indicates that this program is no longer in effect and has not been funded and there is no expectation of FEMA providing money to cover the cost of installing private storm shelters. It was a special day on Wednesday, June 19 as two organizations that suffered significant loss came together for support. On May 20, 2013, the Moore Medical Center in Moore, Oklahoma was devastated by a tornado that swept through the area. On April 28, 2014, Louisville’s Winston Medical Center suffered a similar fate. This week, David Whitaker the CEO of the Norman Regional Health System, Anne Clouse with the Norman Regional Health Foundation and Jim Wade, a board member traveled to Louisville to “Pay it Forward” and provide support to our local WMC. The City of Louisville’s Board of Aldermen’s meeting began on Tuesday with a presentation of a $10,010,000 check from the city’s insurance company. The amount of the check was to cover the loss of the plywood facility located on S. Church Ave. that was destroyed in the April 28 tornado. As construction was ongoing at the facility, the city took the precaution of raising the insurance coverage up to $10 million just in the past few months. This coverage was for the real estate. Insurance on the equipment at the property is covered by the company intended to occupy the facility. The Winston County Board of Supervisors heard complaints from property owners concerning removal of trees from their property by debris removal contractors. Jimmy Gregory and Hal Estes spoke to the board on Monday. The property owners felt that trees that were not on the right-of-way and that may have fallen back onto their property were improperly cut and hauled away. The owners believed these trees were salvageable as marketable timber and could have been sold by the land owner. The Louisville Lions Club recently installed new officers in their June meeting. Incoming president Terry Arnett is shown here accepting the gavel from outgoing president, Mike Dowd. The Louisville Lions Club meets every third Tuesday at 6:30 PM at Lake Tiak O'Khata. This morning (June 18) the Circuit Court ruled in favor of the City of Louisville after 2 cases were brought before the Court concerning the bid process for debris removal after the April 28 tornado. In the first case, 4-D Construction and Southern Disaster Recovery claimed that the City was in breech by rescinding the contract initially agreed to between the parties on May 19. The following day after review, it was determined that the submitted proposal did not meet all the requirements of the request for proposals. The Judge ruled that the City's authorization to engage 4-D and SDR was subject to further review, that the City acted upon that review and the city's action was not capricious. The Winston County Board of Supervisors met on June 16 in their regularly scheduled meeting. At the top of the agenda was Dr. Billy Stewart, President of East Central Community College who briefed the Supervisors on the status of the College. Dr. Stewart indicated that the school’s overall GPA was 3.22 and that the school’s tuition costs was the second most inexpensive in the state last year and would likely be the least expensive for the coming year. Stewart also indicated that ECCC had been ranked as high as 23rd best community college in the United States by Washington Monthly. Press release from Winston County - Winston County, MS June 18th, 2014: After assessing and consulting with Hughes Construction (Debris Removal Contractor), the Winston County Board of Supervisors have scheduled the final pass for debris removal to begin July 7th, 2014. For clarification, debris removal is completed in up to three passes through the affected area. Property owners outside the city limits of Louisville should plan to have all tornado debris to the right of way by or before July 7th. This is Ellie. She is a 8 year old chihuahua. She has been spayed and is looking for a home she will feel comfortable living in. For infomation on this animal or others,please contact the animal shelter at 662-773-4320 or visit the shelter located on 110 Thompson Street. Thank you. The Fair is coming to town this week. 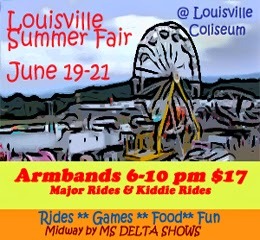 The Louisville Summer Fair will start on Thursday, June19 and run through Saturday, June 21. The midway by Mississippi Delta Shows will be located at the Louisville Coliseum. Armbands are available each night for $17. Through early efforts after the April 28th tornado, Winston County long term relief was able to begin collecting donations for long term recovery needs quickly after the devastation. After much discussion on the best use of funds and the structure of the organization, the Community Based Recovery Committee (CBRC) was established to oversee the funds and their use. As part of that process, CBRC has set up an informational website to keep the public informed of donations, fund use, volunteer opportunities and how to request for assistance. The website http://www.winstonstrong.org will also be tied to a Facebook account 'Winston Strong" and a Twitter account "Winston_Strong" to reach the public across the most popular forms of social media. The Shiloh Volunteer Fire Department made a donation to Winston Strong from money that was raised from the Cold Water Challenge held last weekend. Local Fire Departments and Law Enforcement across the county has participated in the fundraiser that challenges a participant to "enjoy" an ice water bath or make additional donations to the fund. Winston Strong is hosting two Community Based Recovery Fairs next week in Winston County. For those who still need assistance, who are uncertain as to the assistance available or have questions, the Fairs will provide "one stop shopping' as representatives from FEMA, MEMA, SBA, and Winston Strong, the Community Based Recovery Program will have information on SBA loans, FEMA assistance, Insurance and mitigation information. There will also be information on health and well-being, storm shelter and other resource information. Case managers will be on hand to assist and provide information on how to request help, volunteer or donate. The Winston County Supervisors lifted the countywide burn ban today. In discussions with the Winston County Sheriff Jason Pugh and EMA Director Buddy King and after consults with the Mississippi DEQ, the Supervisors voted to remove the ban. Citizens are asked to contact 911 prior to burns of any significant size and use caution and common sense. The lifting of the ban applies only outside of the City of Louisville. This is a reminder to individuals and businesses affected by the Severe Storms, Tornadoes, and Flooding on April 28, 2014 through May 03, 2014 that the deadline to apply for a low-interest rate loan from the U.S. Small Business Administration (SBA) for physical damages is June 30, 2014. In the aftermath of a federally declared disaster, the SBA is the primary federal program for funding long-term disaster recovery for homeowners, renters and businesses. U.S. 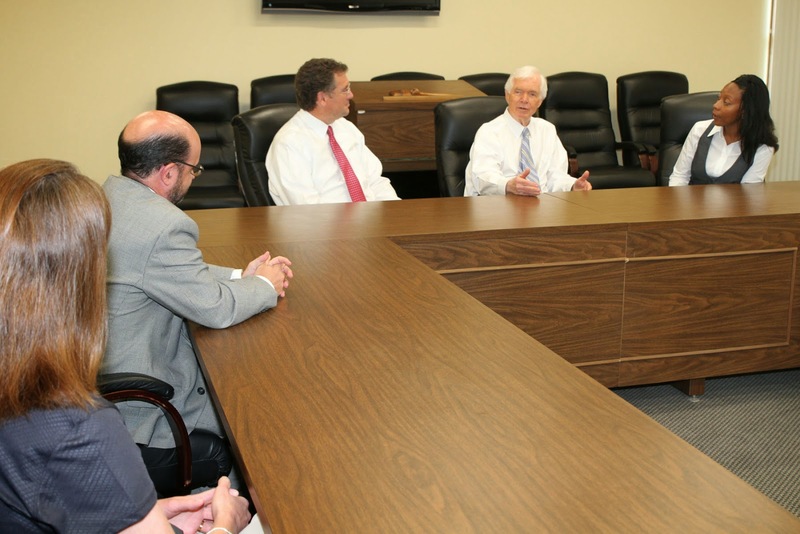 Senator Thad Cochran (fourth from left) visited with East Central Community College officials during a brief campaign stop Monday, June 16 on the Decatur campus. During his remarks, Senator Cochran congratulated East Central on its recent academic successes. He also praised the state’s community and junior college system, of which his parents are products. Senator Cochran, who was accompanied by Congressman Gregg Harper (third from left), is traveling across the state soliciting support in the Republican Runoff Election on June 24, 2014. From left are ECCC officials Dr. Stacey Hollingsworth, executive director for foundation and alumni relations; David Case, vice president for institutional effectiveness and research; and Dr. Teresa Houston, vice president for instruction. A groundbreaking ceremony for a new synthetic turf field is scheduled Friday, June 13, 2014, at East Central Community College’s Bailey Stadium on the Decatur campus. The ceremony was scheduled following approval of the award of the bid by the ECCC Board of Trustees earlier this week. With major debris removal well under way, Winston Volunteer Coordination has several youth and college groups who will be available during the next several weeks to assist homeowners with the removal of small debris and the raking/cleaning of yards following the removal of major debris from the site. If you would like assistance, please contact Winston Volunteer Coordination at(405)403-1817 for more information or come by the temporary Operation Center for the Winston County EMA, 750 N. Church Street, at the Old Brickyard Office. A Volunteer Work Request/Right of Property Entry must be completed before work can begin. New and transfer students who plan to attend the fall 2014 semester at East Central Community College and have not registered for classes are encouraged to attend orientation activities scheduled Friday, June 20 on the Decatur campus. “Although four sessions are scheduled during summer months, we encourage students to attend the earliest session as possible in order to get the classes they want for the fall semester,” said Dr. Randall E. Lee, Vice President for Student Services. The Louisville Municipal School District took the opportunity in their regularly scheduled meeting on Tuesday to recognize the local mentors for the District’s dropout prevention program. Local mentors volunteer to work with students during the school day. These volunteers go to Louisville Elementary, Eiland Middle School, and to Noxapater to assist students who may be at risk now or in the future. These mentors must pass a background check and are matched with students based upon a series of criteria. coach at East Central Community College in Decatur, announced Warrior head football coach Ken Karcher. Cooper will serve as tight ends coach. Prior to joining the ECCC staff, Cooper served the past two years as an assistant coach for the Abilene Bombers of the Arena Football League, and the past four years as a graduate assistant at Hardin-Simmons University, also located in Abilene. His duties with the Abilene Bombers included coaching offensive linemen, tight ends and fullbacks. He also assisted with special teams. The Louisville Municipal School District Board of Trustees met on Tuesday, June 10, 2014 in a regularly scheduled meeting. After approving the minutes of the previous meeting, the board accepted a significant number of donations to various schools in the district for victims of the recent tornado. The board also voted to approve to dispose of unused textbooks from various schools in the district. Officials from the University Medical Center made a presentation to the board on a Telehealth pilot program. Christi Henderson with UMC explained the program that would allow students to have access to a doctor while still in school preventing lost time in the classroom and missed work time for parents. The agenda for the June 16, 2014 meeting of the Winston County Board of Supervisors is now available online at the County's website. To view the agenda - click here. 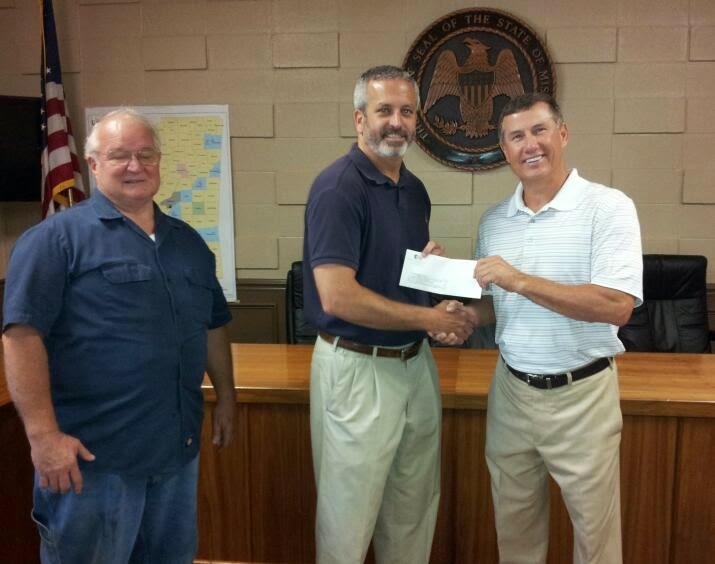 On June 12, 2014 Mike Bowers and Jim Flake of OTR Wheel Engineering, Inc. presented Mayor Will Hill a check for $5,000.00 to the Winston County Disaster Relief Fund. Betty Byrd presented a check to the Winston County Relief Fund on Wednesday morning at the Winston County Partnership Offices. The AT&T Pioneers are a group of volunteers of retired and active employees of AT&T who provide community service through education and disaster relief. David Case was recently selected Vice President for Institutional Research and Effectiveness at East Central Community College in Decatur, announced ECCC President Dr. Billy W. Stewart. 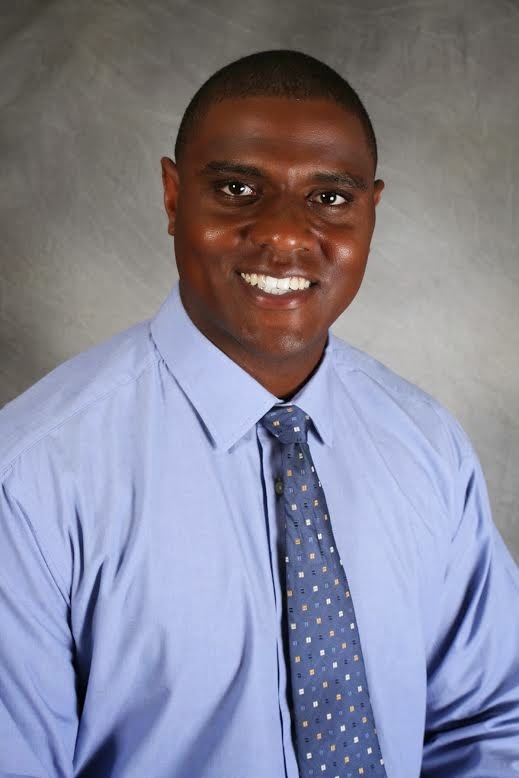 Case, who began his new duties on May 1, 2014, previously served as Director of Monitoring at the Mississippi Community College Board in Jackson, where he assisted in developing an improved statewide audit system for community colleges for more than 80,000 students. These sweet loving puppies are looking for a good home. They are all females and have not been spayed. They are about 4 or 5 months old. Come by the Louisville Animal Shelter located on 110 Thompson Street or call Barbara at 662-705-0398. Thank you! SCOOBA – For the second year in a row, an AmeriCorps NCCC team worked hard to make improvements at East Mississippi Community College’s Scooba campus. 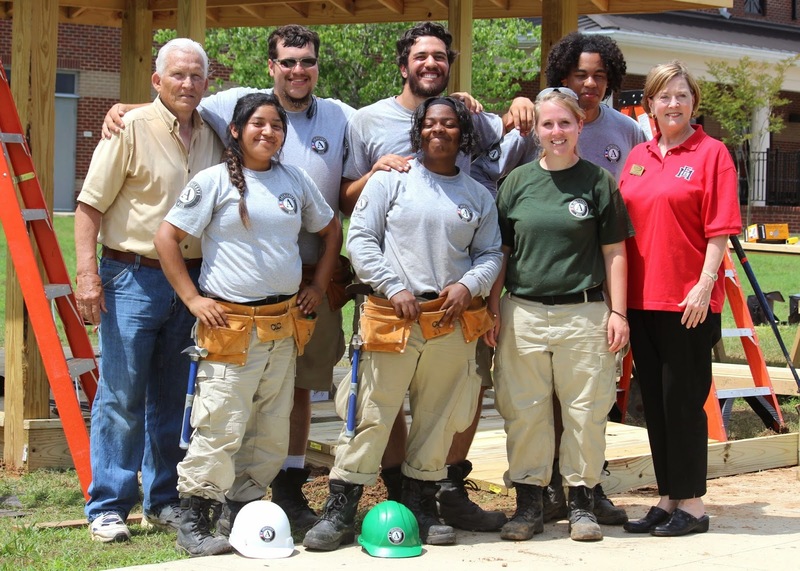 The six-person team from the National Civilian Community Corps arrived in Scooba May 20 and worked on numerous projects until departing for another work site June 4. Dorian Lachance "The Magic Man"